The photographs below are of a Victorian Tiled Hallway at a house in the historic market and spa town of Knaresborough. The tiles were actually over a hundred years old and as you can see in a terrible state. As well as looking dull and unloved they were traces of plaster, oil based paint and even chewing gum. The first job was to tackle the chewing gum with a sharp flat metal scraper taking to keep the blade level with the tile and not to scratch the tile. Once this was done the next task was to remove the paint by treating the affected areas with a product called Remove and Go which basically does what it says on the bottle. I find it works best by allowing it to soak into the affected area for about ten minutes before scrubbing it in and then rinsing it off with water. The next step was to give the whole floor a good deep clean with a strong dilution of Tile Doctor Pro-clean, which deep cleans the tiles without damaging them. Again, you leave the product to soak into the tile before scrubbing it in and then rinsing it off and extracting the now soiled solution with a wet vacuum. After that we gave the floor an acid rinse using Tile Doctor Acid Gel which removed the plaster and also adds a slight acid tint into the base of tile which helps to eliminate a problem we sometimes get with these old tiles called efflorescence which is where mineral salts rise up through the floor leaving white marks on the surface. Once cleaned and fully dried a damp test was conducted to confirm the floor was dry before sealing. 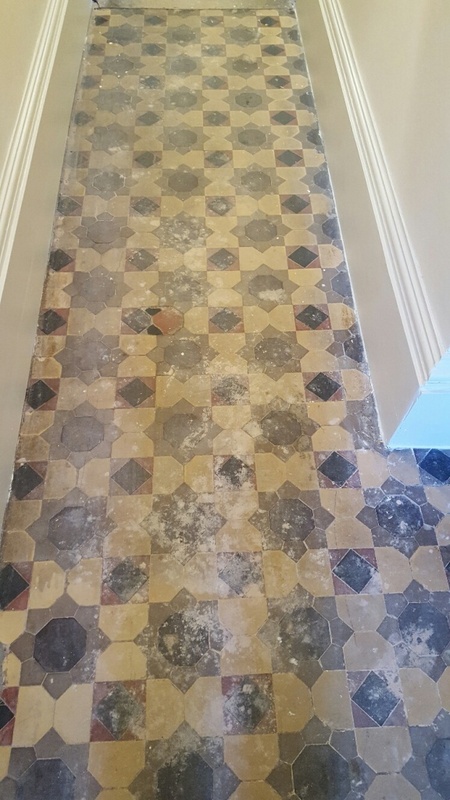 The customer has requested a satin finish, however we only apply this if there is no immediate damp issues or mineral salts present, if so we use a sealer called Tile Doctor Colour Grow which is fully breathable and soaks into the pores of the tile leaving a matt finish. 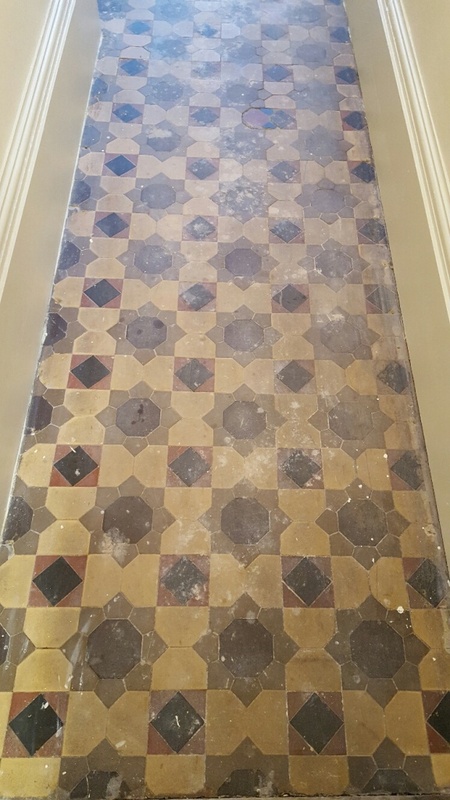 On this occasion, everything was in normal state so we applied four coats of Tile Doctor Seal and Go which provided the satin finish the customer wanted. 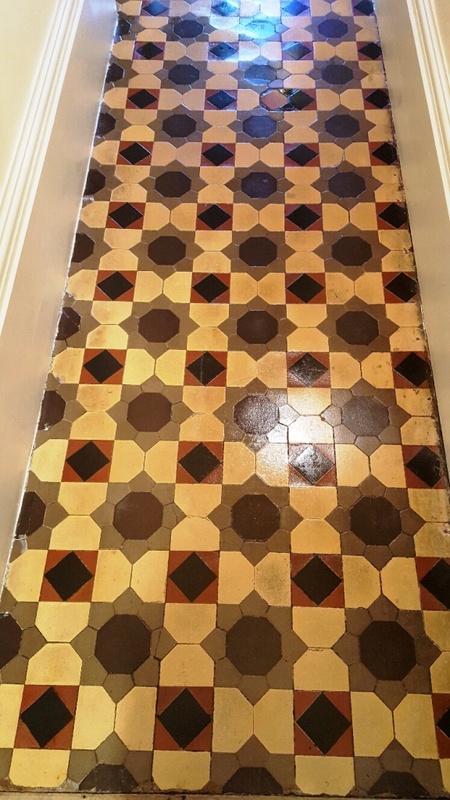 We pretty much through the book at this floor to restore it and I’m sure you will agree the effort was well worth it as the floor now looks brand new. Last thing to do before leaving the customer was to provide them with some advice on how to clean the floor going forward. On this occasion, I explained that the floor will maintain its appearance as long as the sealer remains intact; now sealers will wear down over time however you can maximise their life by using a PH neutral cleaning product as anything stronger will cause premature erosion. To get them off on the right track I left them with a free 500ml bottle of Tile Doctor Neutral cleaner which is PH neutral and will not damage the sealer. 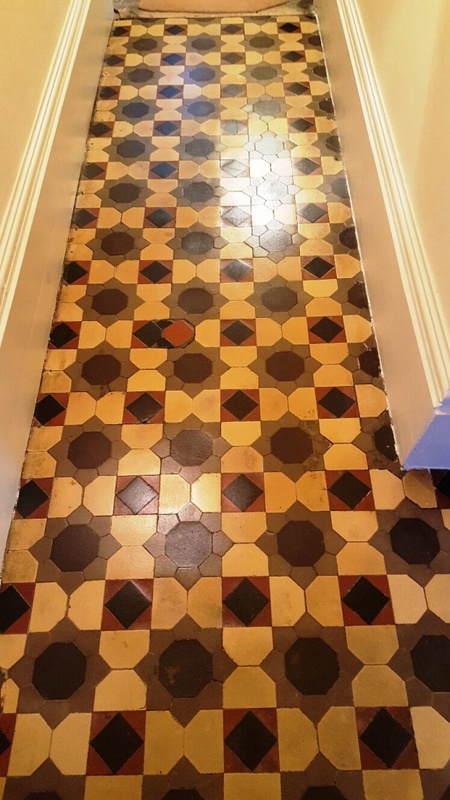 This entry was posted in Victorian Posts and tagged chewing gum, hallway, Knaresborough, paint, restoration, Tiled, victorian by AbzDominise. Bookmark the permalink. Tile Doctor is the largest specialist Tile and Stone cleaning network in the UK and have a number of services available including the provision of a regular maintenance service; whatever or wherever your problem, give us a call on 0845 652 4652 for help and advice.